What Is DA Form 647-1? DA Form 647-1, Personnel Register is a form used by the Electronic Military Personnel Office (eMILPO) to record departures and arrivals of personnel to units because of a permanent change of station (PCS) or when entering temporary duty. DA Form 647-1 is a shortened version of the DA Form 647, Personnel Register, a form that is available for use only to non-foreigners. The latest version of the form - sometimes incorrectly referred to as the DD Form 647 - was released by the Department of the Army (DA) in April 2010. An up-to-date fillable DA Form 647-1 is available for download and digital filing below or can be found through the Army Publishing Directorate website. 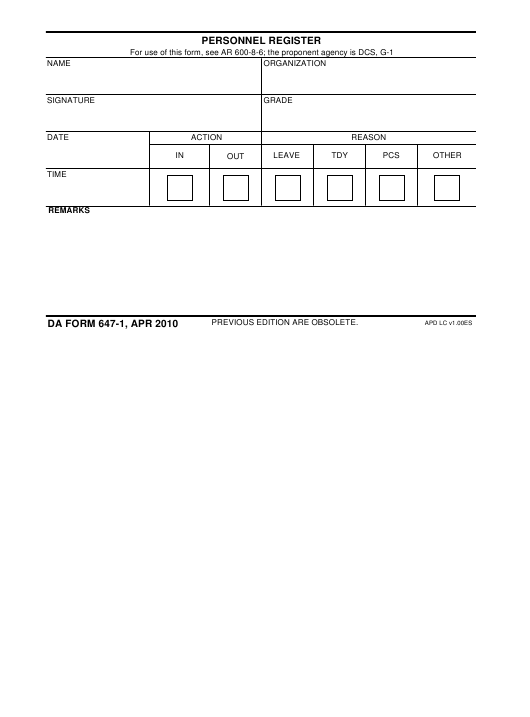 How To Fill Out Da Form 647-1? A separate form should be used for signing in and signing out. Boxes 1 through 4 are for the soldier's name, organization, grade and signature. Boxes 5 and 6 - Date and Time - should indicate the correct date and time of each entry. The next box - Action - specifies the type of movement. The box on the far right - Reason - should indicate the reason for the movement out of the four options given. Soldiers who depart on transition leave should check the PCS option and specify the number of days of their leave in the remarks at the bottom of the page. In a case when the unit has to move due to a change of command or the death of the commander, authorized personnel must file DA Form 3986, Personnel Asset Inventory. This form is used to document physical muster formations (PAI) and should be conducted fourteen days prior to the date of moving.